Beach ball sized ball is tossed around in a game designed to stimulate conversation about one’s family history. 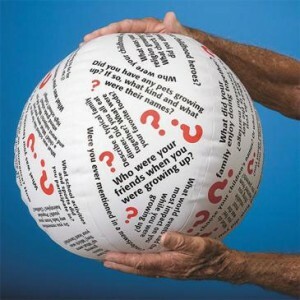 Engage your clients in reminiscence and social interaction with this family history themed conversation ball. Featuring open-ended questions and discussion prompts like “Why did you choose your children’s names?” and “Describe a typical family dinner.” the ball is perfect for one-on one sessions or group activities. Easily adapted for all age and functioning levels. Includes a handy activity sheet with ideas for play. Inflates to beach ball size. Balloon pump available for purchase separately.